September 21, 2006 - CSI forensics consultant Gary Telgenhoff will speak Thursday, Sept. 28, on the campus of Arkansas State University in Jonesboro. His presentation, “Speak for You: The Real Vegas CSI,” begins at 7 p.m. in the Student Union Auditorium. It is free and open to the public. 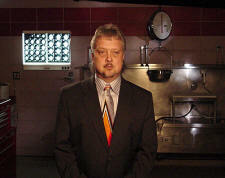 Dr. Telgenhoff, a consultant on the hit television drama “CSI: Crime Scene Investigation,” is employed as a forensic pathologist and deputy medical examiner at the Clark County Coroner’s Office in Las Vegas. Each year he sees approximately one thousand bodies, of which he autopsies about 450; roughly 10 percent of those are homicides. His presence is often required in court with regard to his findings and determination of cause and manner of death. Telgenhoff attended graduate school at Eastern Michigan University and received a master’s degree in biology and physiology. He completed the degree in 1992 while in the first year of medical school at Michigan State University. He served five years of pathology residency in different locations in Ohio before relocating to Las Vegas. Along with his professional interests, he is a rock musician who has played with various bands. And, some of his music has even been played on the soundtrack of a CSI episode. Telgenhoff’s presentation is co-sponsored by the College of Humanities and Social Sciences and the Lecture-Concert Series. The next Lecture-Concert event will be Civil Rights Activist Diane Nash who will speak on “The Nonviolent Movement of the 1960’s: A Legacy for Today” on Thursday, Oct. 5, at 7 p.m. in the Student Union Auditorium.